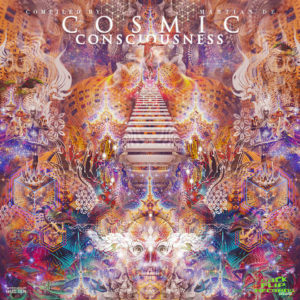 Backflip Records is proud to present Cosmic Consciousness, a 12-track odyssey crafted by sonic scientists from around the world. Coming to you from a distant galaxy, Martian De has assembled a plethora of mind-bending and consciousness-elevating trips to take you on a deep exploration of the cosmos of one’s self and the surrounding universe. Become one with the sound as it takes you on a wild psychedelic ride! Artwork by Aashit Singh @ theare.co.in . Mastered by Dar Kapo @ Backflip Recs HQ. Another great album from Backflip Family! A really great comp. I especially like tracks 1, 6, 8, 9, 10 and 11, but all the rest are good. I’m going to put this on my radio show, Cricketsong Selections on Triplag webradio on December 15 at 10 PM UTC.